That little American Boy Scroll Saw I got the other day, got me intrigued. 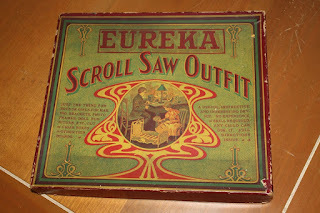 It was too much fun, hence the historical details were sketchy in my last post. 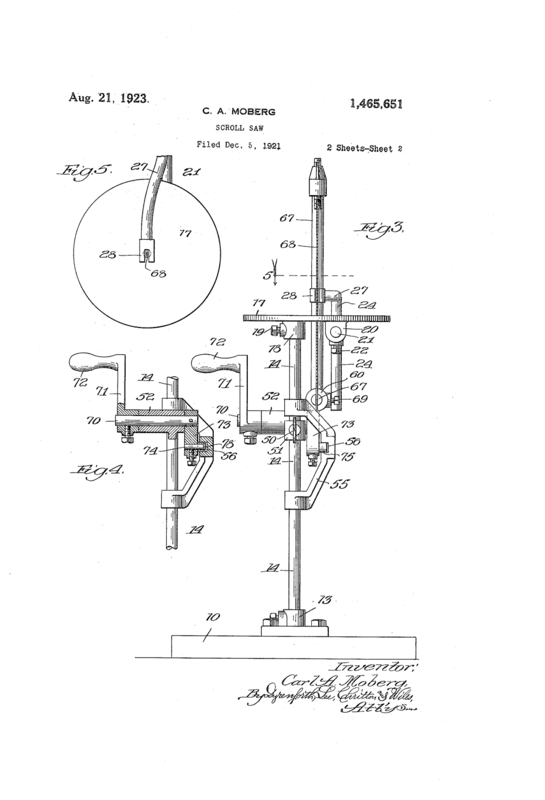 When you have a Patent No it is always an easy way to get lots of details: inventor, town, company etc. 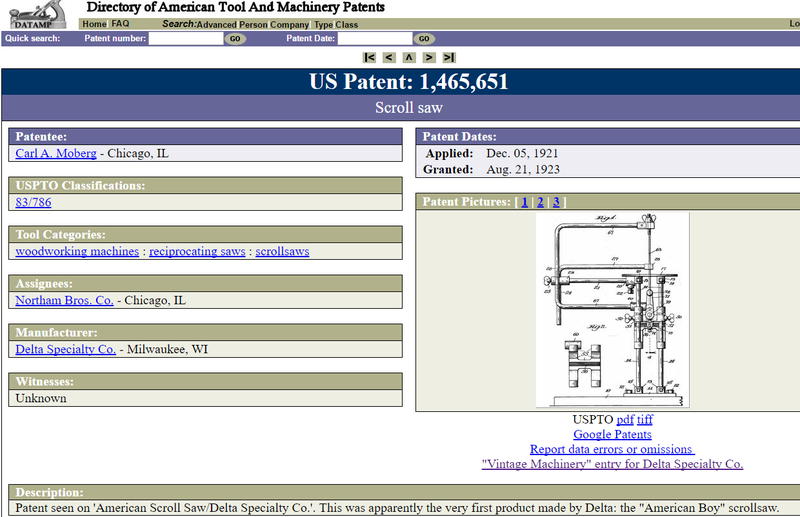 Looking it up in DATAMP we find only 6 patents (woodworking related) issued that day. 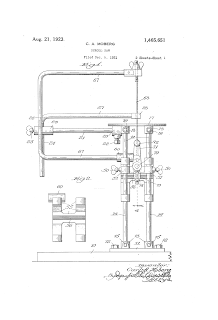 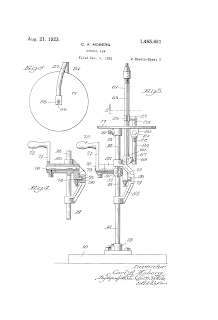 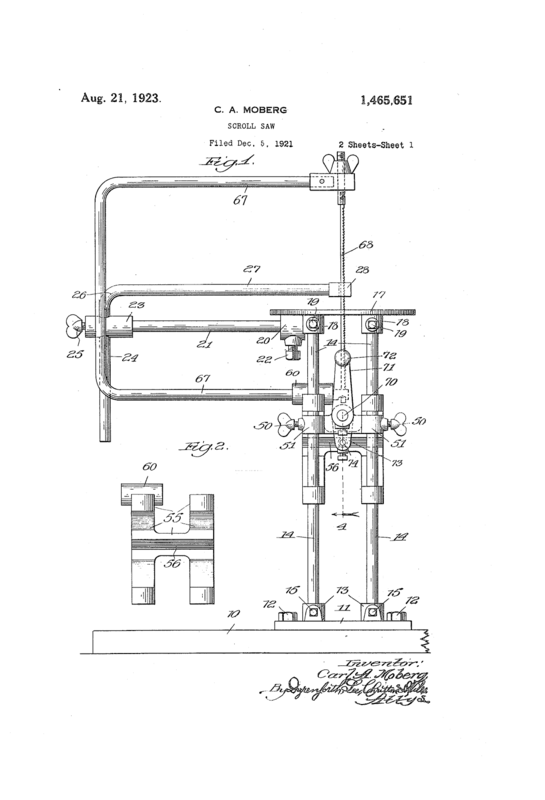 This is one great advantage of looking thru DATAMP, you only look at woodworking related patents, it quickly narrows it down. 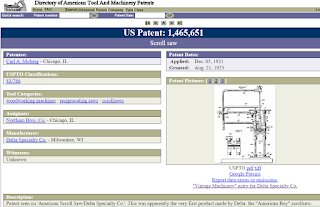 Our Patent is No 1,465,651 issued to a Mr C.A. 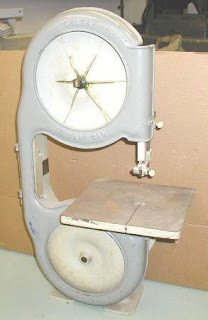 Moberg. 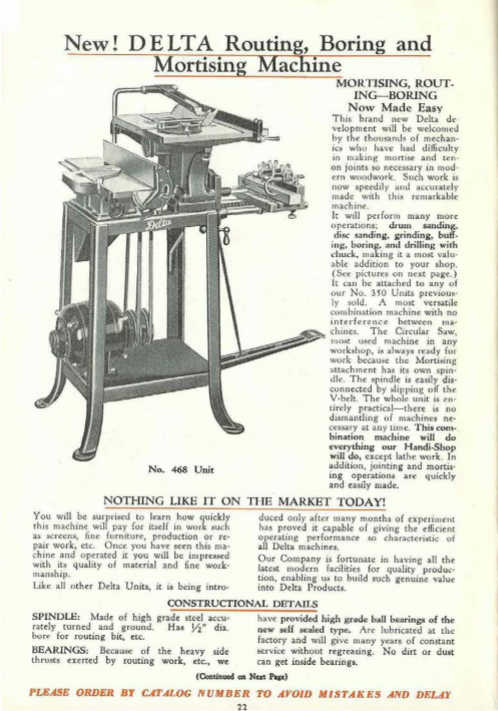 So it was not invented by Tautz after all, but manufactured by his company: Delta Specialty Co.
One of the first thing that strike me when I started looking at pictures and catalogs text on line was some differences in the wheel pattern, base differences in size and either black or red, The working table went from round to square and changed size etc. So I tried to come up with a more detailed knowledge surrounding this tool and its influence. 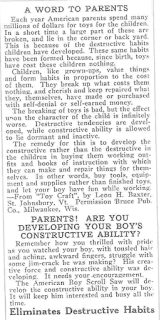 Influence ? you ask? 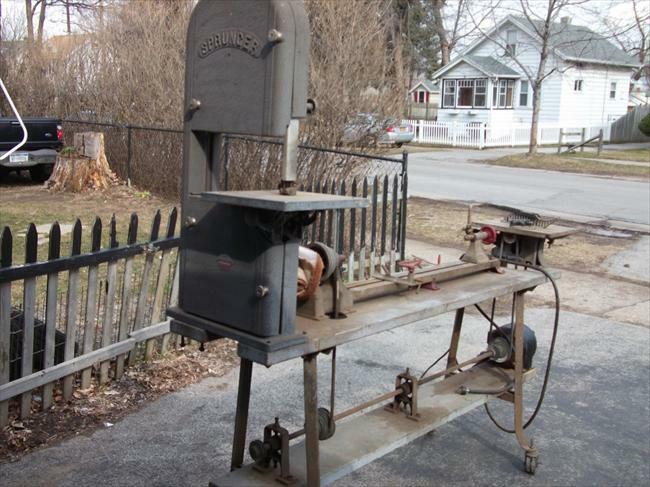 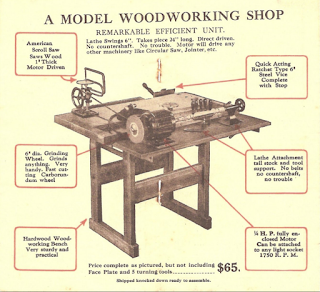 Yes, it truly was an innovation and it left an interesting legacy, one that affect us to this day in our woodworking hobby pursuit. Give the boy the tools and materials he need to build things (keep him out of Dad's tool). 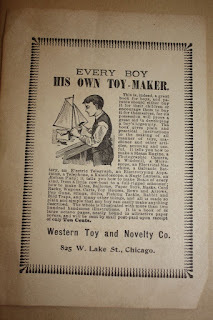 He will learn the values of thing (selling them to make pocket money). 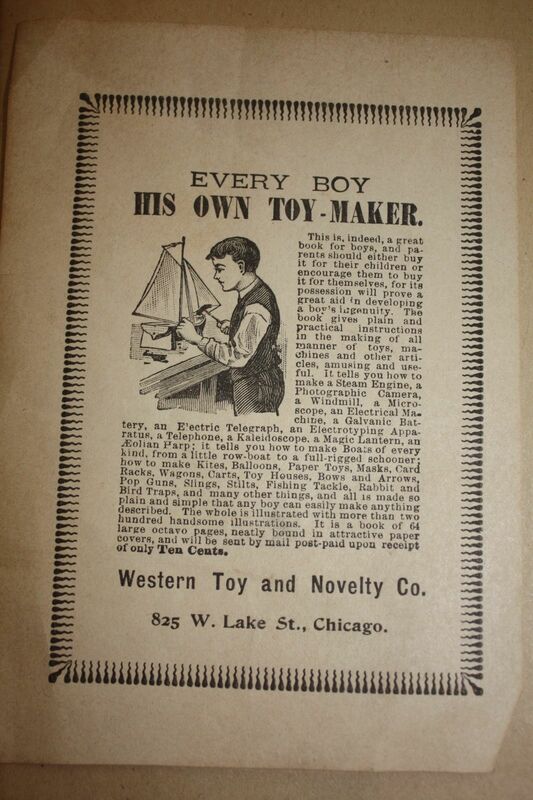 And he will be too busy to get into trouble, everyone wins! 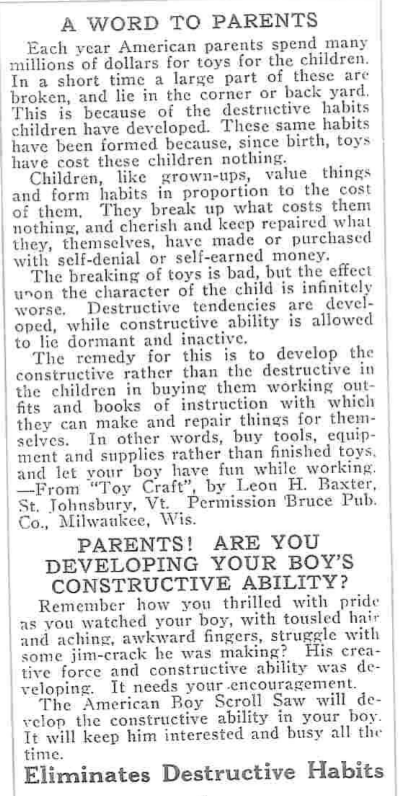 his constructive and destructive tendencies at the same time, bonus! 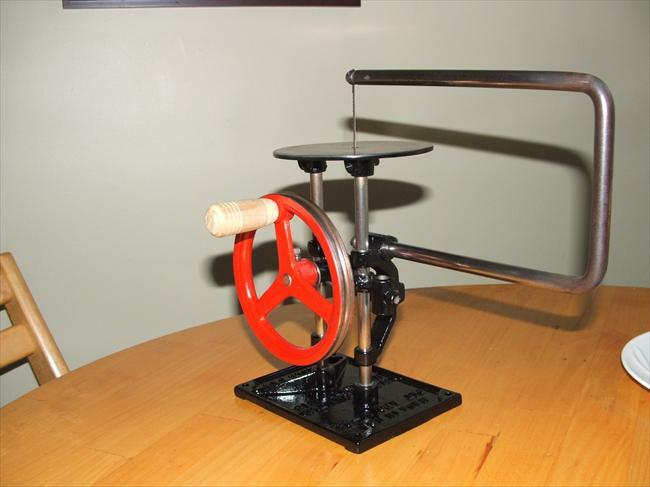 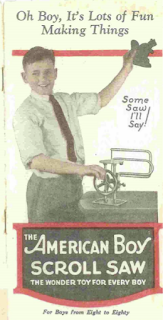 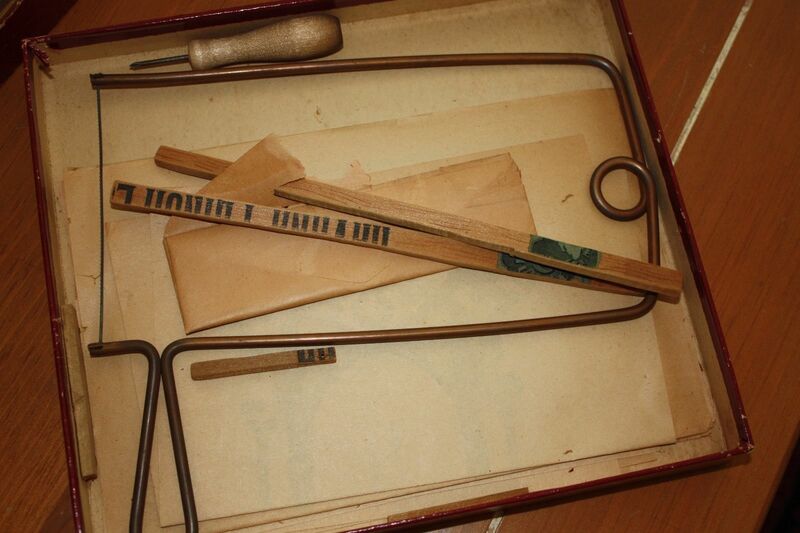 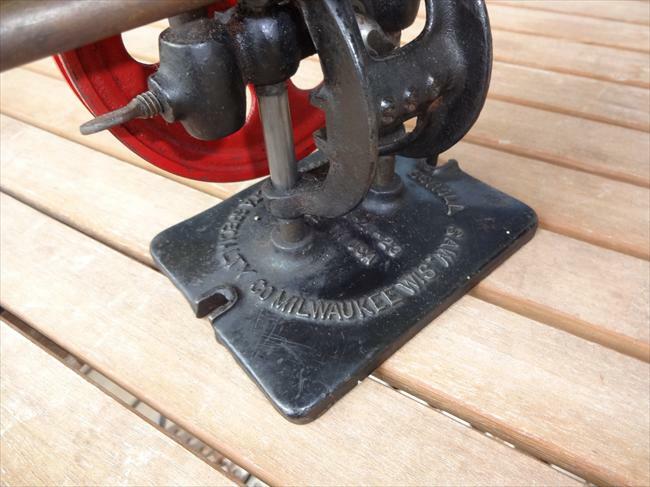 The American Boy Scroll saw was designed and developed to meet the great demand for an improved coping saw. 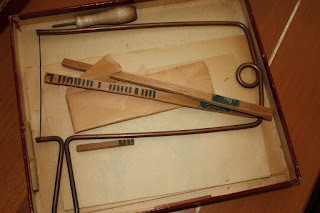 While the ordinary coping saw frame cost very little indeed, it has many faults and disadvantages. For instance it require a great deal of skill to produce a square and straight cut, and the least edging or wiggling will results in breaking the blade. 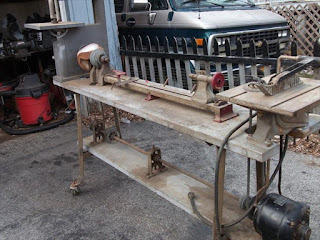 To work with an ordinary Coping saw frame is tiresome for the right as well as the left hand. 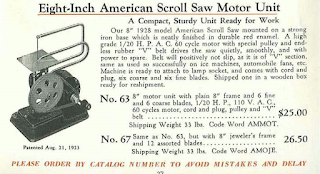 The American Boy Saw is the only saw selling at such a remarkable low price which eliminates all of the above named faults. 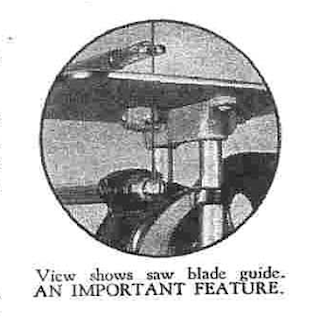 In 1925 it cost US $5.95 for the complete outfit, instructions and spare blades. 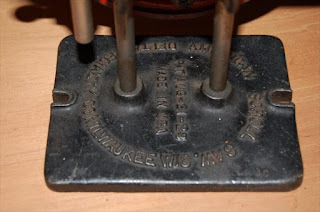 Notice also, the 4 holes in each corners are replaced by two open slot holes. 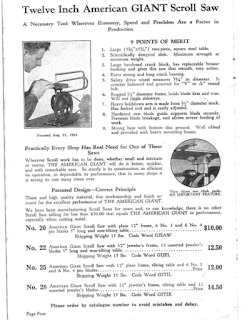 The "Giant" model had a different flywheel/pulley and crank. Instead of three spoke such as mine, it had round holes. 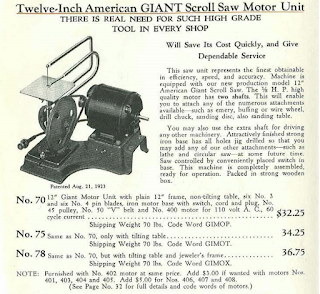 It now measure 7-1/4 in, was 4-3/4 on mine. That should gives the wheel more mass. 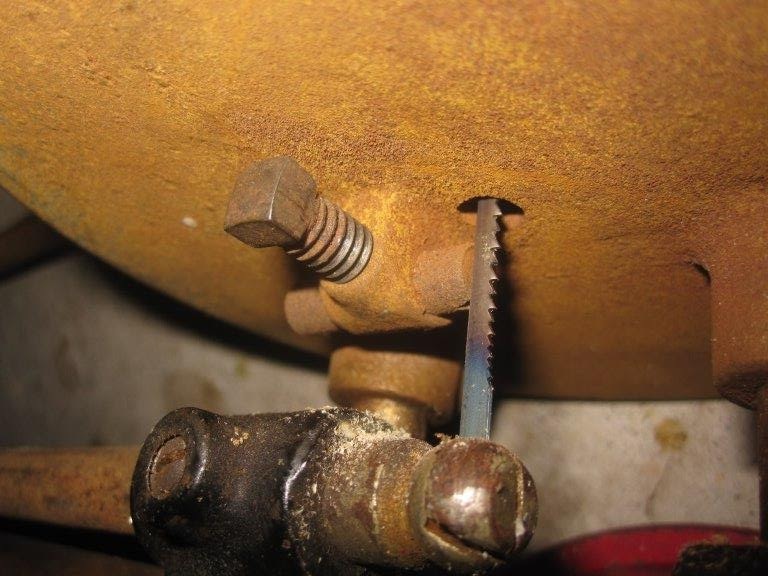 Note in this pic, it is missing the hold down, as is often the case. 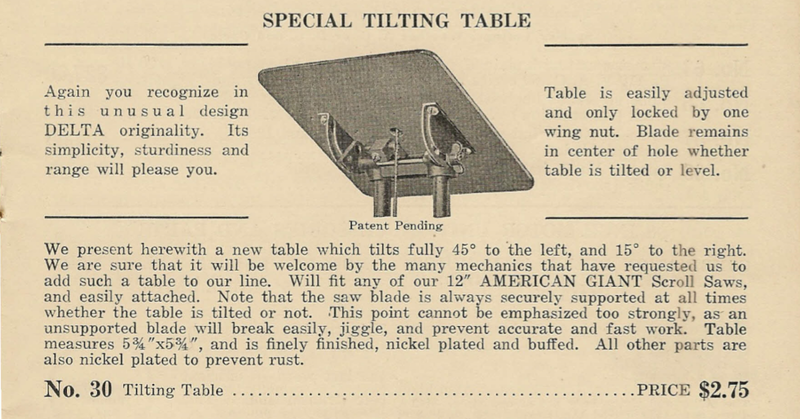 The original table was a 4-1/4 inch diameter.. That was later increase at the time of the Giant model release, to a 4-1/2 in square table. 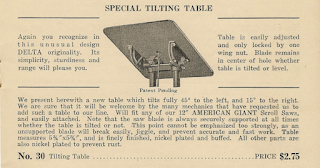 A 5-3/4 in square table was introduced with the Giant, which utility was greatly enhanced by adding a tilting mechanism to it. 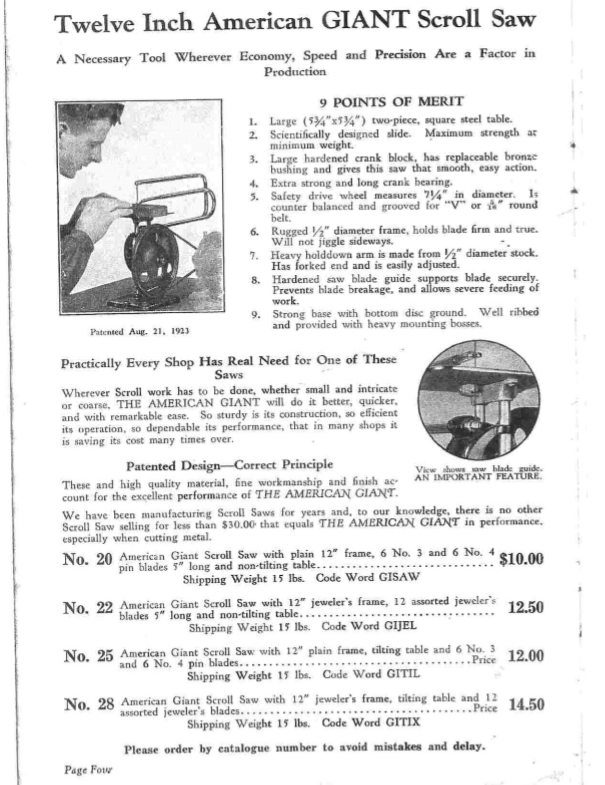 Besides the Giant and the regular, there was two sizes of throat openings available: They normally came with a pair of 8 inches frames, but you could specify or order separately the 12 inch frames. Model like mine, but with the original 8 inch arms. 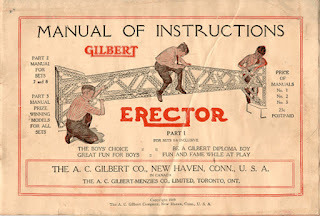 Mine came with the 12 inches set, and is more tippy. 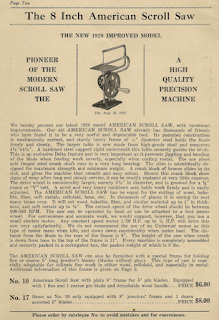 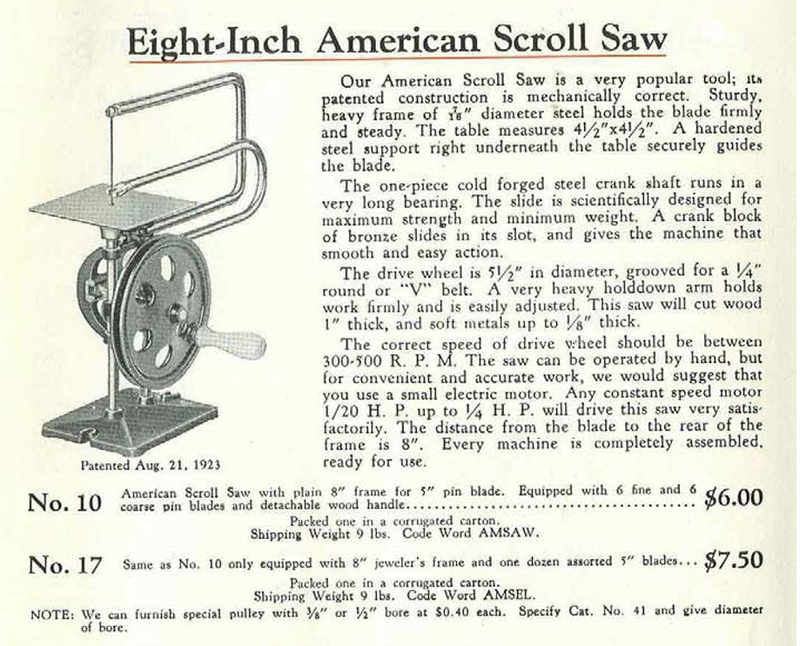 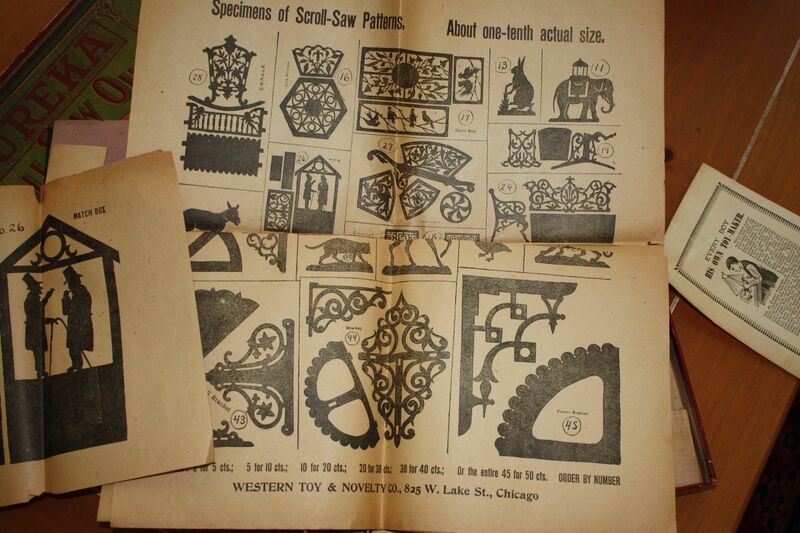 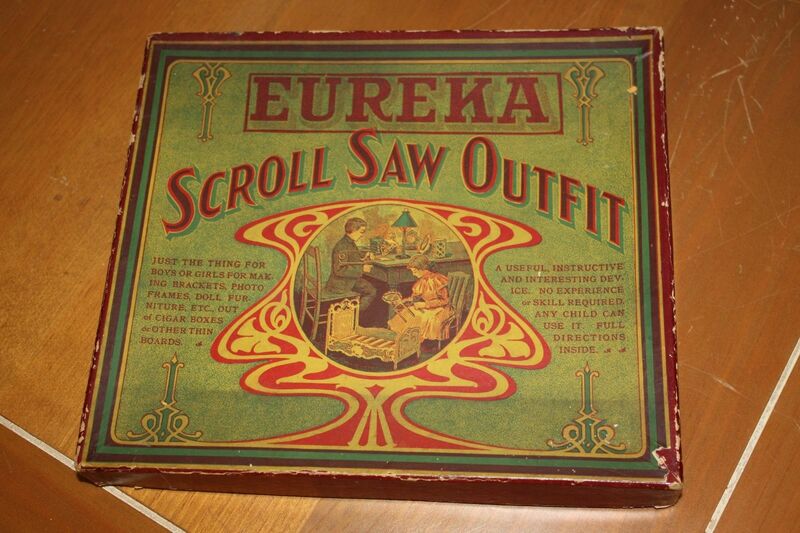 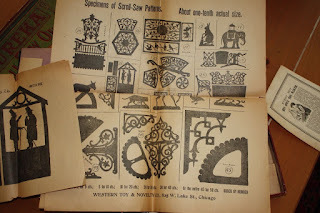 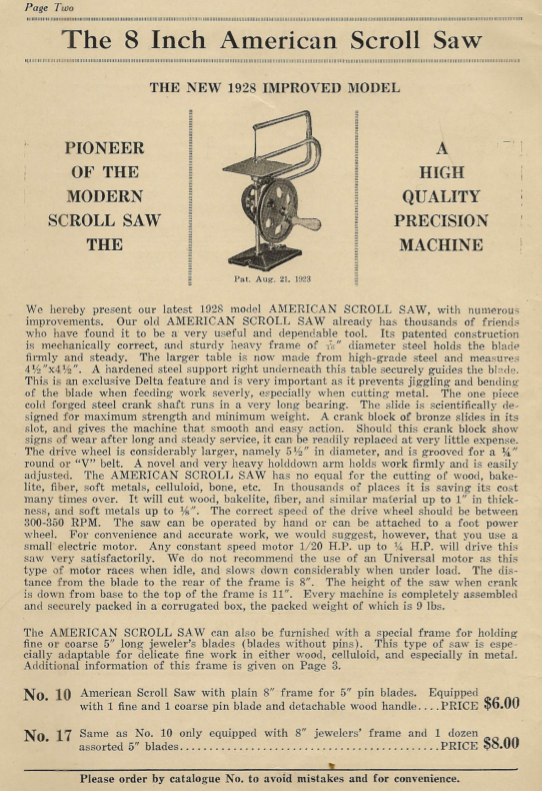 In 1928 the series of American Scroll Saws was changed, the name "Boy" was dropped, highlighting the serious work this machine could do for very little and new and improved models were introduced and more variations added. 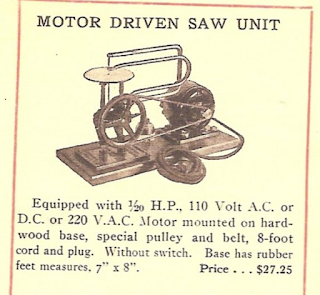 and mentioned that it can be adapted to foot powered or electrical power. 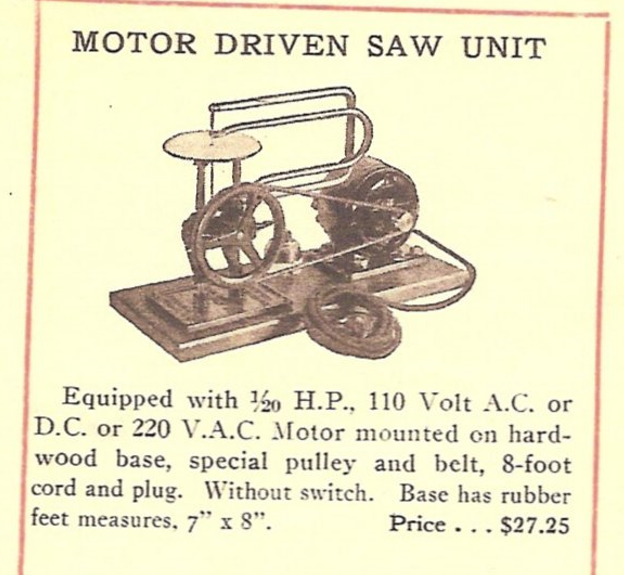 But you could buy the saw unit mounted on a base. 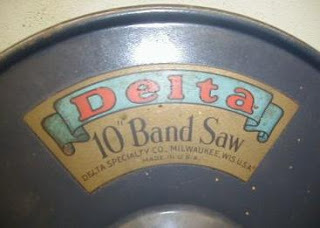 Notice how the saw is bolted down to this cast frame. 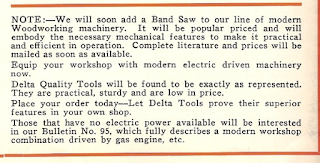 One of the other "innovation" from Delta was to realize the importance of using a double shafted electric motor. Nothing new, but until now they were used mostly on grinders and polishers. They realized that by using the shaft on each ends they could easily produced a whole motorized workshop using various inexpensive attachments. 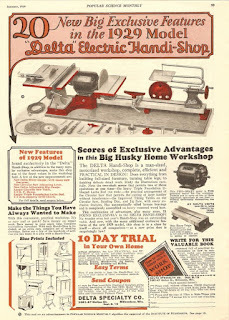 Of course if you did not wanted to cut a slot into your perfectly good workbench, they would sell you one. 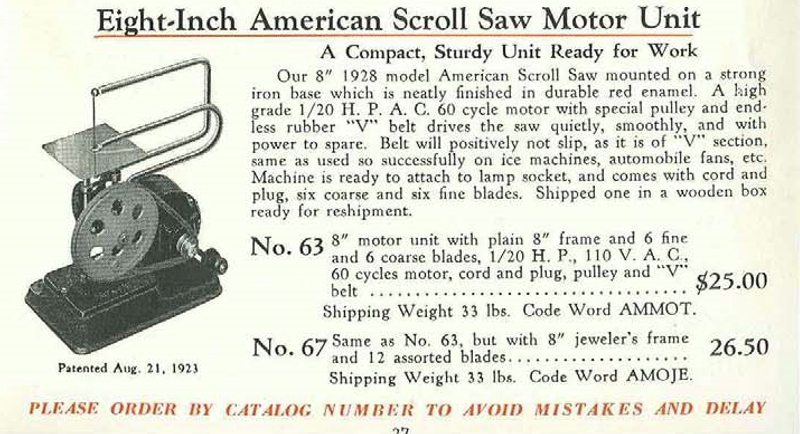 These modifications were made possible by the belt groove around the flywheel. 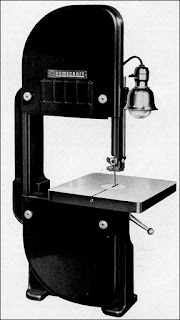 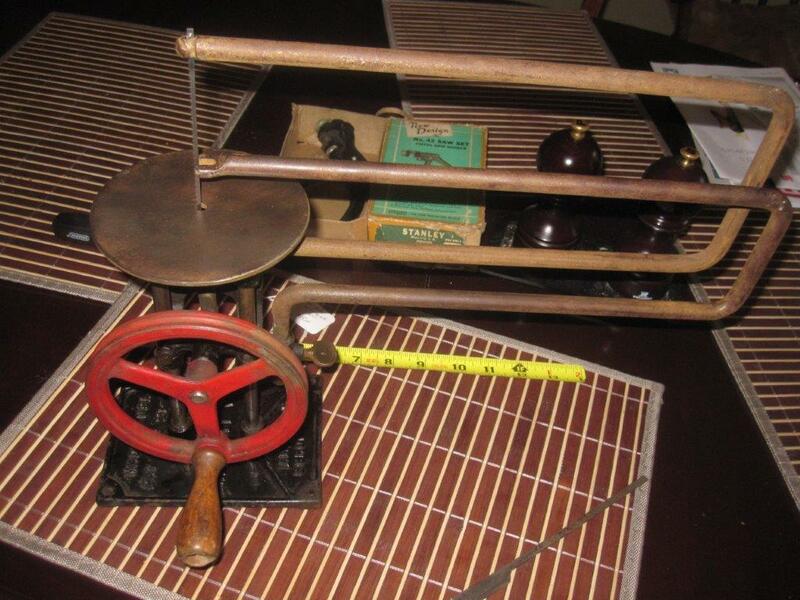 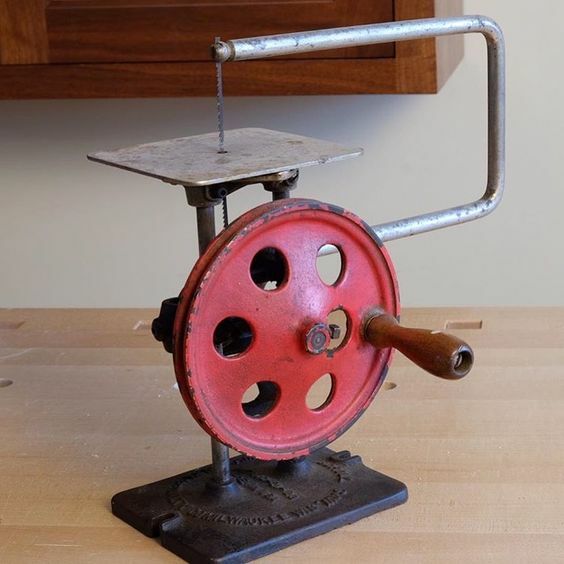 This little thing, was the spark that started a "new" revolution in hobbyist woodworking; The multi combination machines. Recognize the red base for the lathe headstock/sander and tilting table saw? Same shown above with scroll saw mounted. 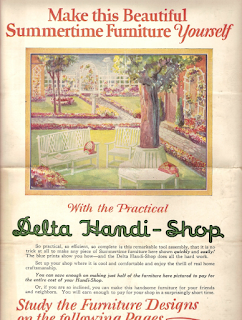 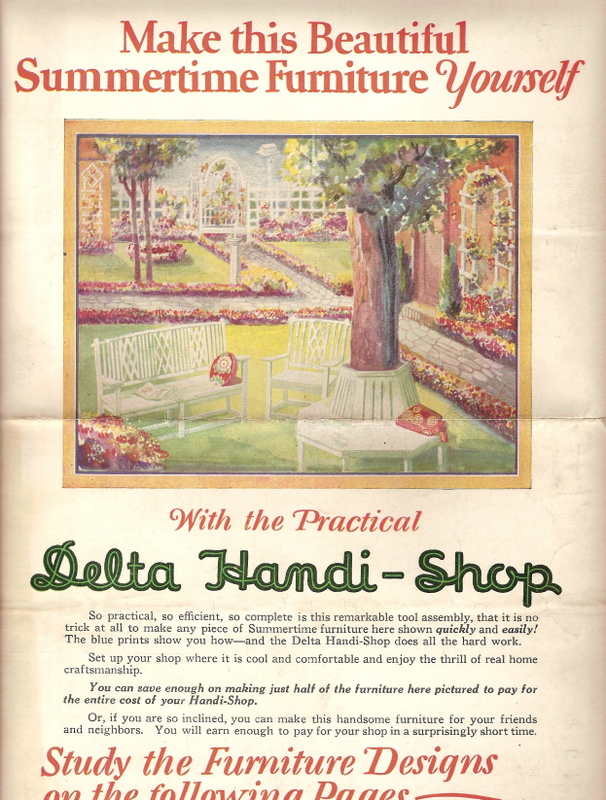 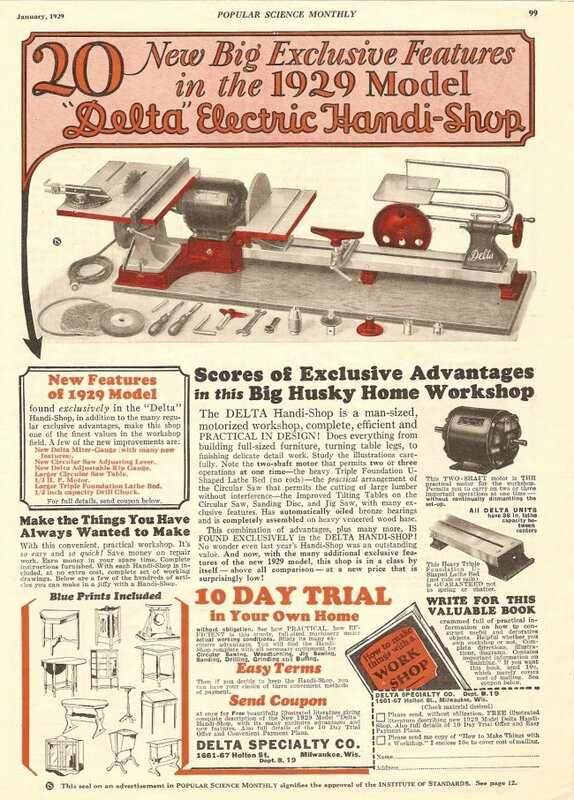 The Delta "Electric" Handy-Shop, may have not been the first one, they had competition, but it was compact and affordable thanks to payments plan. 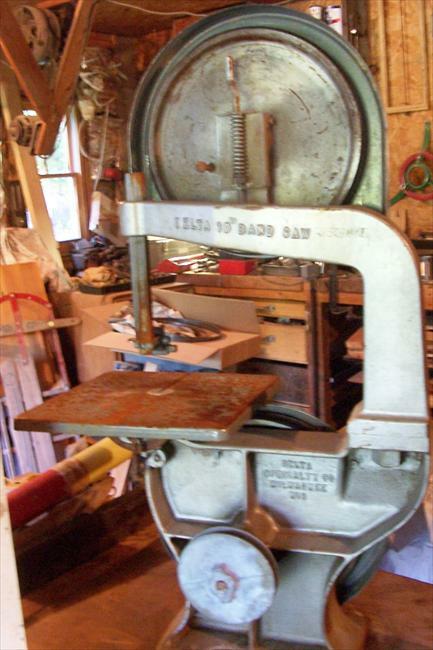 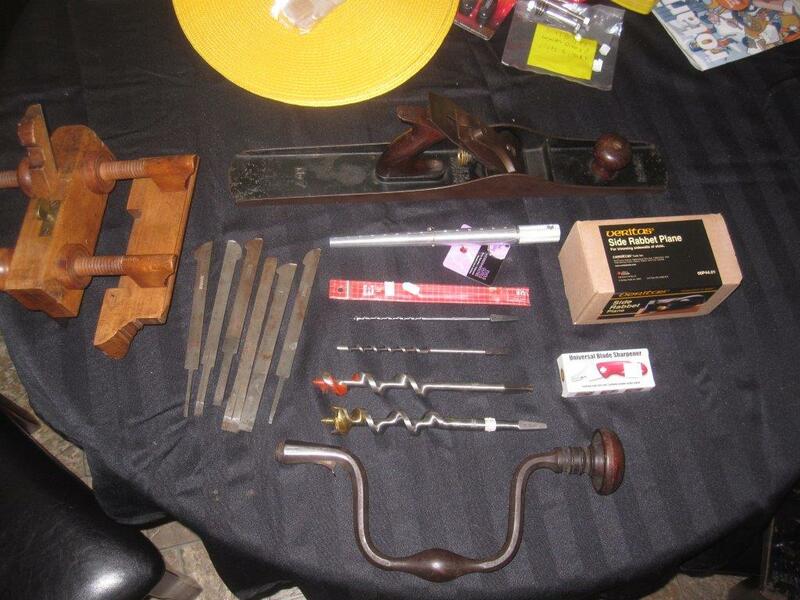 Despite its cost, it quickly became one of the most popular home workshop items in America. Don't let its diminutive size fools you, you can build big things with it, such as full scale furniture, outdoor furniture and arbors etc. Later there was a combination tablesaw, jointer and an horizontal boring machine all in one. At this point, given the cost of ownership and the world about to go broke on a large scale, how could anyone afford these?? 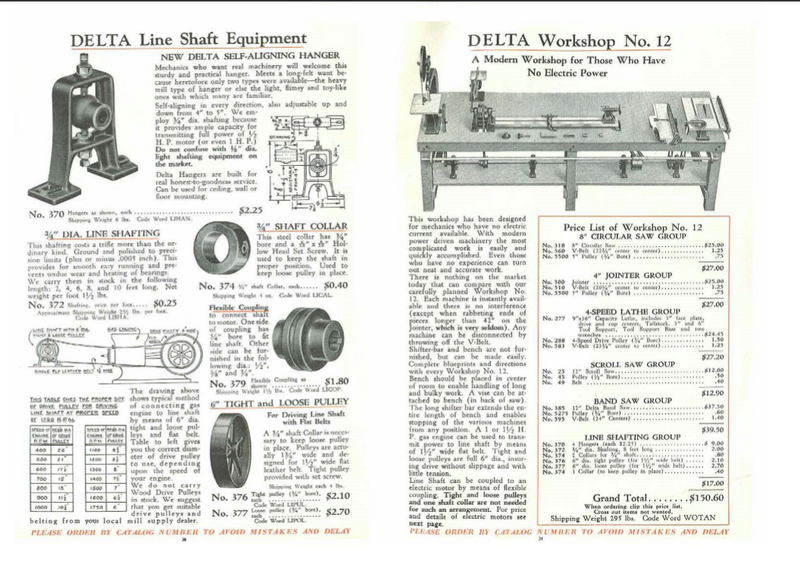 Which were quickly followed by the venerable Delta 14 in model. Delta original 14 in bandsaw. The one we are all familiar with in N.A. 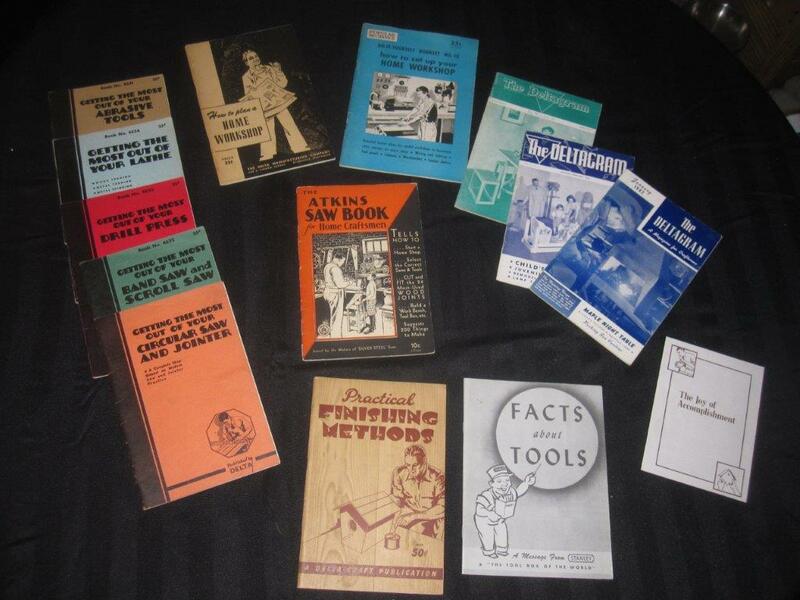 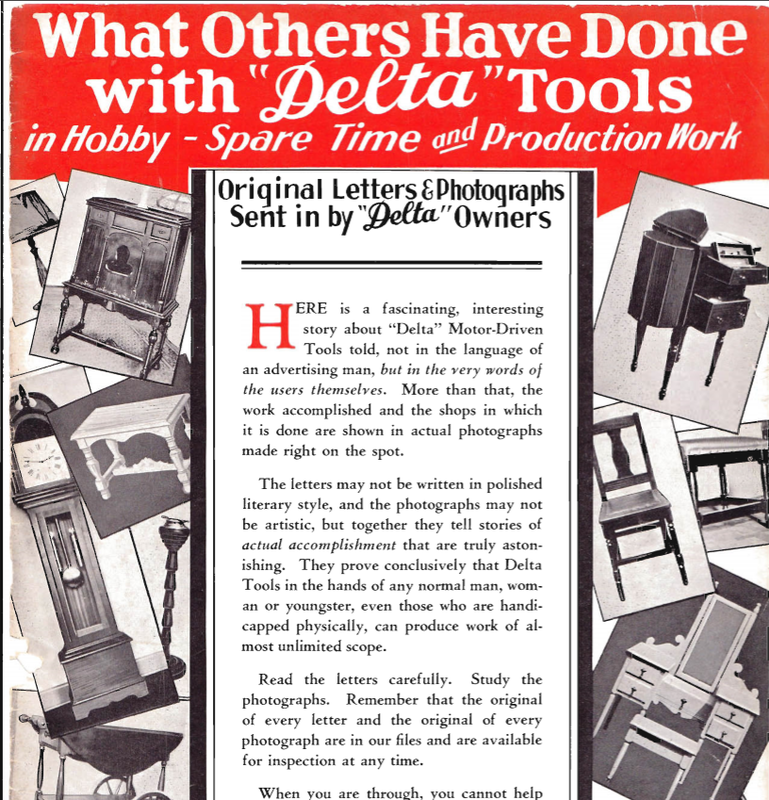 During those years, there was very little to none woodworking publications such as today's magazines. 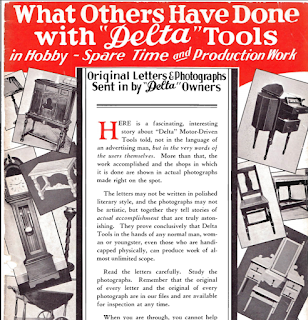 In order to fill a need and promoted its machinery, Delta introduced the Deltagram on a monthly basis. 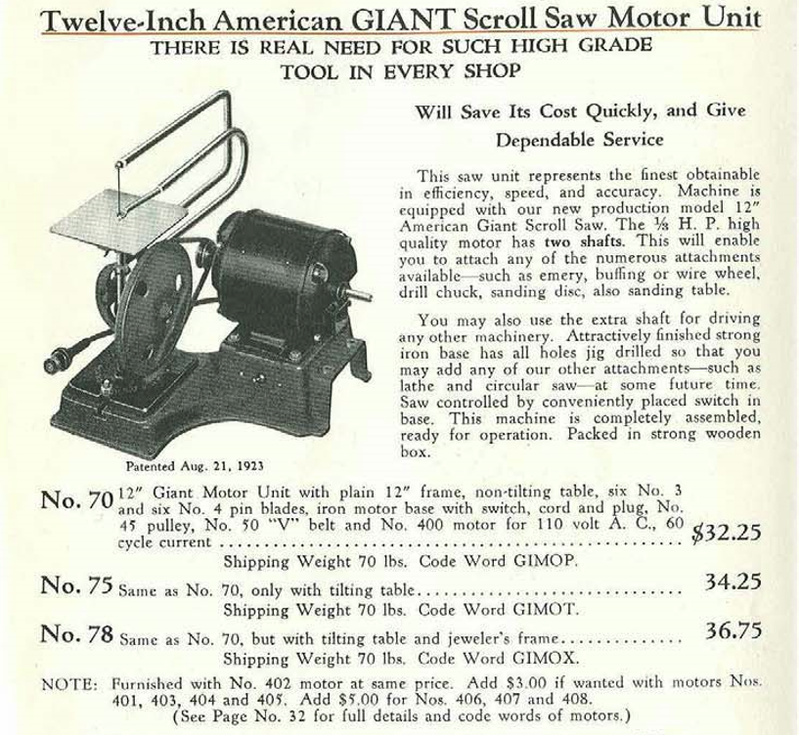 That publication contained woodworking plans, tool talk and technique for aspiring woodworkers. Many of these original plans have been re-recycled in various forms thru the years in various magazines. 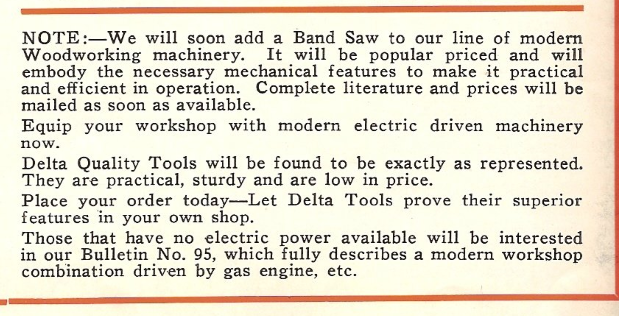 Toolmakers quickly realized that it is one thing to built tools, you also have to create a need for them via education. 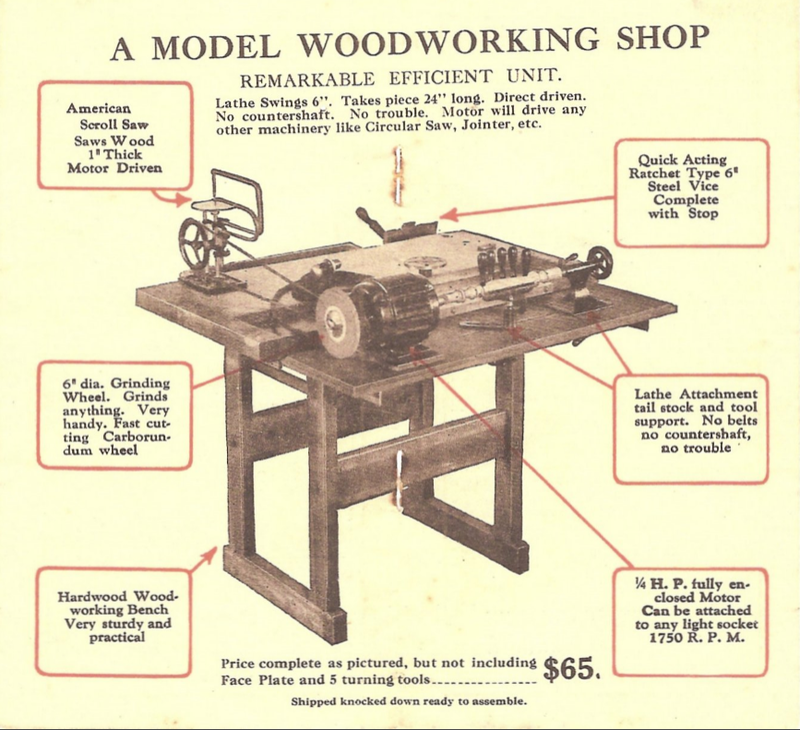 Promoting woodworking as a hobby was a big part of that and one of a lasting legacy to these days. 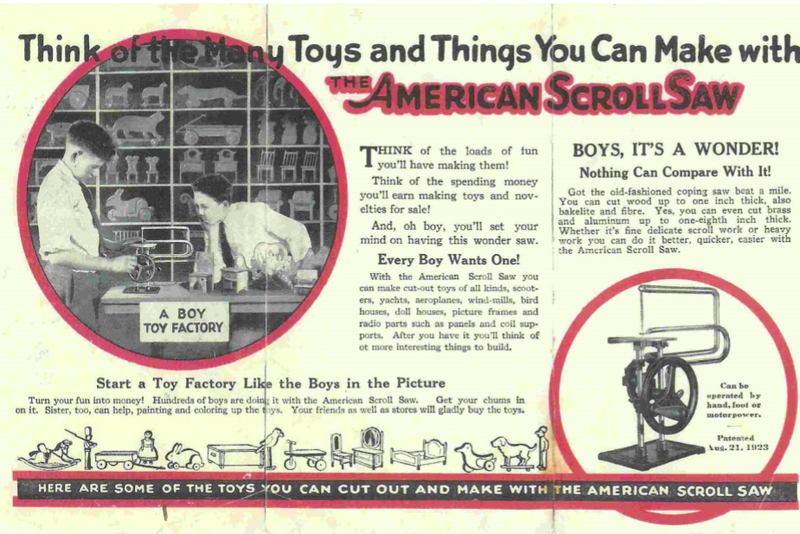 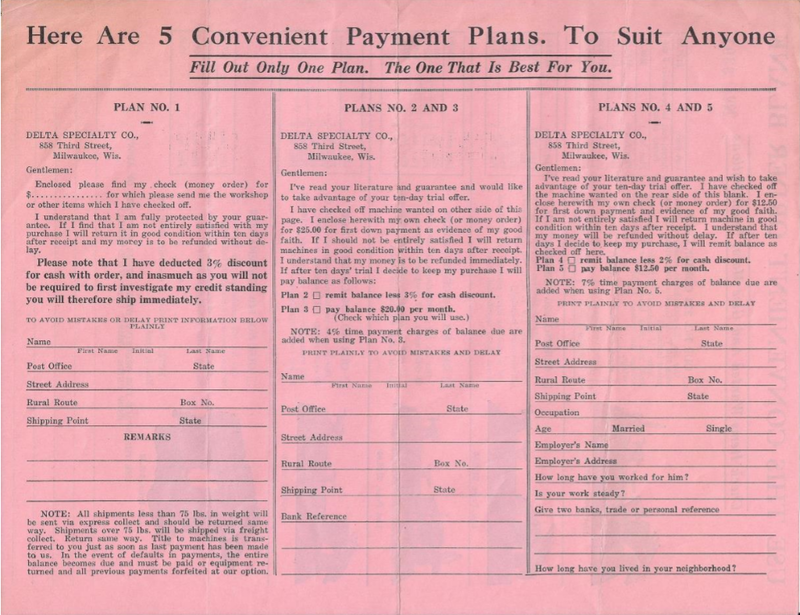 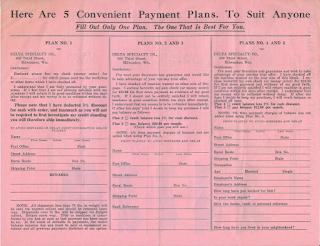 In those days following the great depression, numerous brochures, pamphlets, promoted making supplementary income by building things for sale. 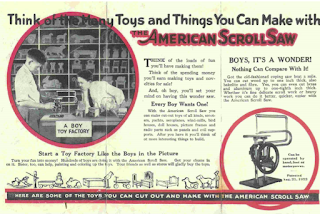 During WWII it became more about making do with "nothing" as imposed by severe restrictions on various war effort's essential materials. 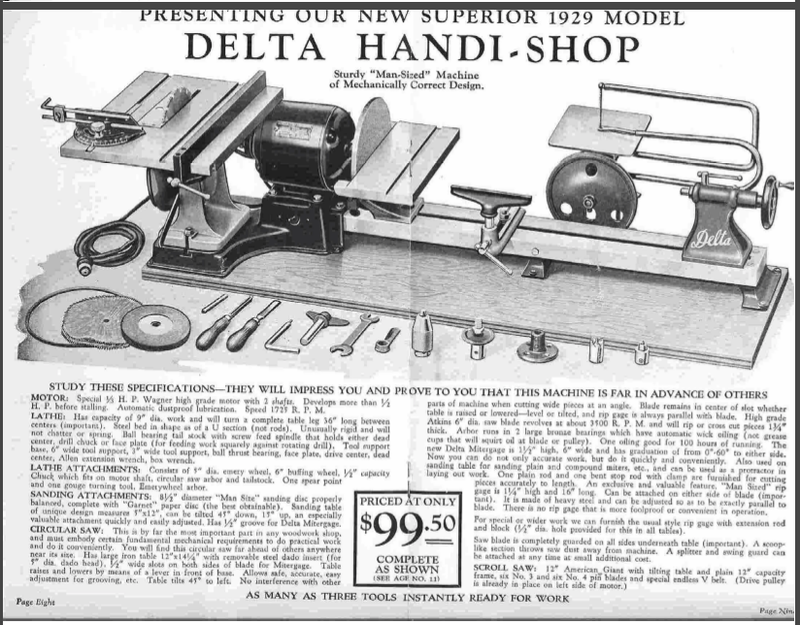 How to fix everything and building the stuff you could no longer buy was a big part of it also. To this day there still exist a "Market" for Do It Yourselves (DIY) magazines, books, online publications and etc. 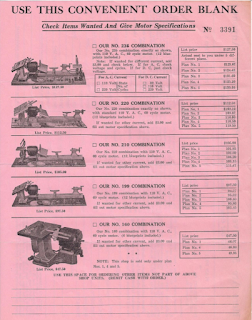 Combination machines still exist in various forms. 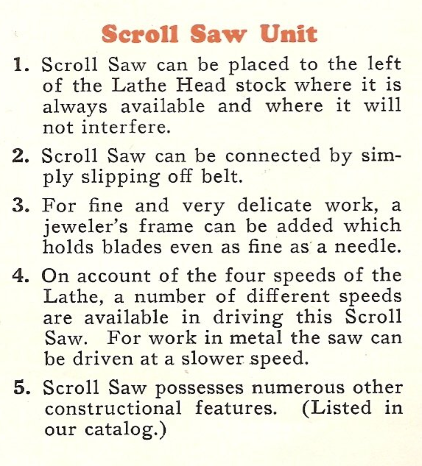 Lots of it can be traced back to the introduction of this little saw ... 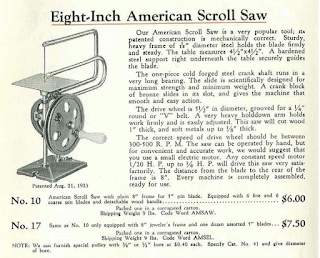 Some saw I'll say!